In this first of a series of posts to mark the 15th anniversary of The University of Nottingham in Malaysia, Professor Christophe Wiart, of the School of Pharmacy at UNMC, talks about the fascinating flora that he has encountered as a botanist in Malaysia’s rich and extensive rainforests. He is pictured above exploring with his late local friend, Mr. Sulaiman. Dating back 70 million years, the rainforests of Southeast Asia, and particularly Malaysia, are the oldest surviving equatorial forests in the world and are where the first flowering plants are believed to have originated. For centuries, the rich biodiversity of Malaysia’s forests have yielded valuable medicines like camphor, spices like pepper, cinnamon, nutmeg, clove, benzoin and perfumes like eaglewood. Such medicinal plants have been used since the dawn of time in China and India. Ancient Egyptians used Asian cinnamon, which has antibacterial and antifungal properties, not only for cooking and incense, but also for embalming mummies. Both the Greeks and Romans used ginger from Asia as a spice and a stomach-calming medicine. Today, the thousands of different species of trees, climbers and herbs of the Malaysian rainforest, represent a vast source of exploration for drug discovery and research is currently being done in that direction here at UNMC. 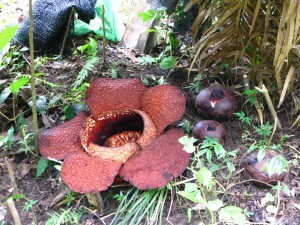 One of the most iconic and spectacular plants of Malaysia is the Rafflesia. 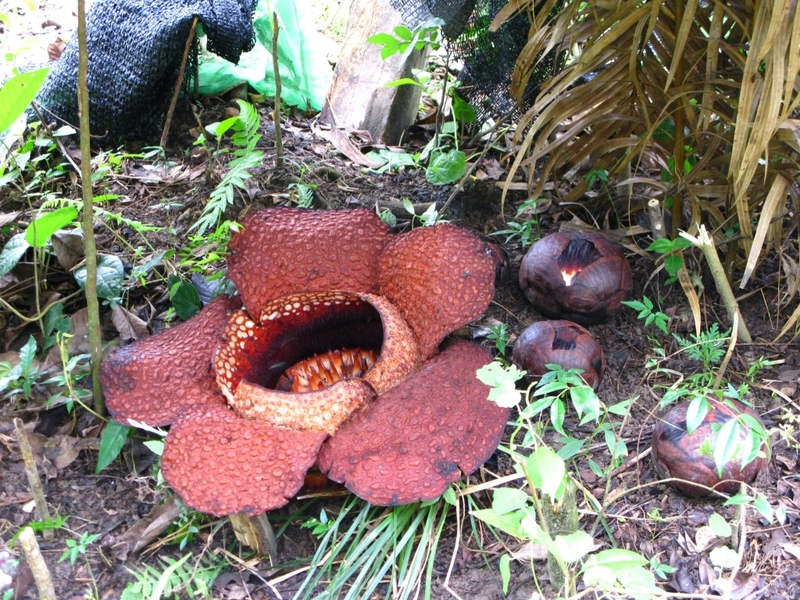 One of 16 species, the Rafflesia Arnoldii (pictured above), is the world’s largest flower, with a three-foot diameter. This picture postcard favourite, also goes by the name of corpse flower, on account of its distinctive, pungent odor of decay. Rafflesia has no roots or leaves and lives symbiotically on forest trees. Found deep in the jungle and only in bloom for a short time, it can be difficult to encounter without walking for several days. Although I have seldom seen Rafflesia alive – only once in Sabah – dried samples of the plant obtained for my research led to us being first to be published on its anti-bacterial properties. What us scientists confirmed, is what Malaysians have known for hundreds of years; they used Rafflesia as a medicine to prevent bacterial infection following childbirth before the hospital era. 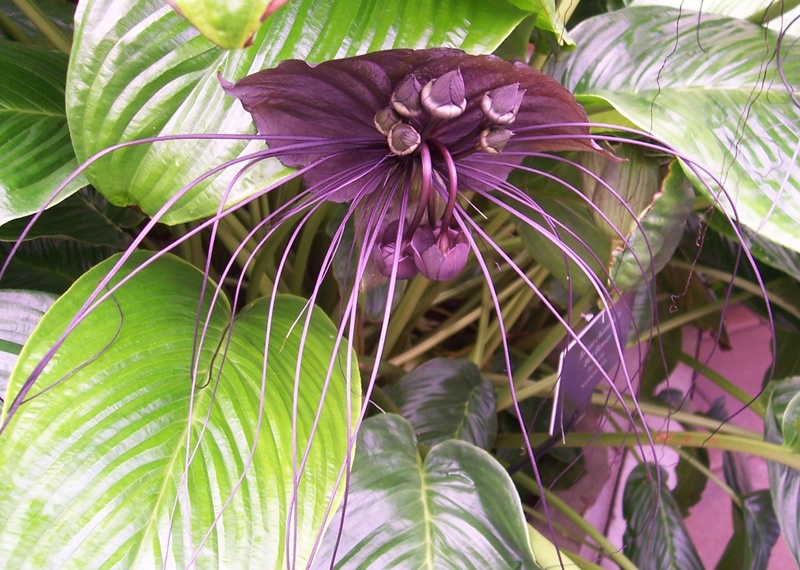 With unusual, black petals and ‘whiskers’ that reach up to 28” in length (above), the shade-loving Tacca plant (Black bat flower) and the carnivorous pitcher plant (Nepenthes) are other peculiar sights of the Malaysian rainforest. The pitcher plant has evolved modified leaves which form a deep cavity, filled with sweet-smelling liquid, which traps pray such as ants, flies, centipedes and even frogs. It is also known as monkey cup, as the animals have been seen drinking rainwater harvested from its body. An extraordinary Malaysian tree is styrax bezoin (below). Not only does it produce masses of beautiful, white flowers, it also provides a resin known as benzoin, which has been used in European apothecary for 2,000 years. Today, that same resin is used to manufacture cough syrups which are listed in several Pharmaceutical Codex. Another tree that is native to Malaysia is camphor — in fact its name originates from the Malay word, kapur. When the bark and leaves are distilled it produces a white crystalline substance which has been used for many hundreds of years as a spice, a medicine and an insect repellant. 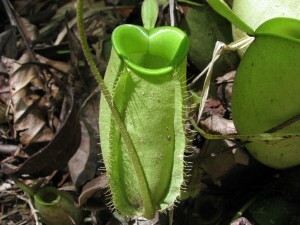 Among the weird and wonderful flora of Malaysia are a number of toxic plants. 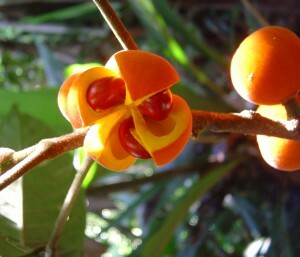 The strychnos nux-vomica (below) grows in the rainforest and the disc-shape seeds of its orange fruit contain the deadly poison, strychnine. It only takes a small amount to produce severe effects in people and can be fatal. Cerbera odollam is a beautiful tree that bears apple-like fruits which contain cardiotonic glycosides like cerberine – this is a powerful poison with a potency that can disrupt heart function. In ancient times it was used to coat arrow heads to hunt small animals and birds, as well as a diuretic and a rat poison. 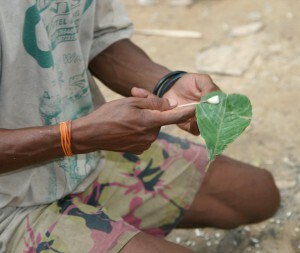 Similarly, the milky latex of the Antiaris toxicaria plant, a member of the fig family, has been used by the indigenous people of the Malayan Penninsular (the “orang asli”) to poison darts to hunt monkeys for food for centuries (as seen in the demonstration above). While in the mangroves of Malaysia, Excoecaria agallocha induce blindness, skin blistering and anaphylactic shock if its sap is touched. Even its generic name comes from the Latin for “blinder”. Staying alert to these potentially deadly or debilitating plants is essential when out on field work! I have been lucky enough to study the medicinal plants of South East Asia for many years now and have collected, identified and classified hundreds of species from its ancient rainforests. At the same time, in this unique line of work I have also witnessed first-hand the impact of human interference that now threatens this once-abundant habitat. When flying above Malaysia, with a birds-eye view, you can instantly see the scars of rainforest burnt away to make way for the palm oil tree plantations we demand for agriculture and energy. Between 2000 and 2012, Malaysia had the highest rate of deforestation anywhere in the world. Deforestation means the disappearance of plants which not only help the world to breathe, but also sustain thousands of species of insects, birds, mammalians, and could play a key role in human survival in a post-antibiotic era. Therefore, perhaps one of the most urgent and exciting points about studying botany and ethnopharmacology in Malaysia today is to find and isolate lead compounds in those native plants to treat bacterial infection, cancers, and other major illnesses before they disappear forever. Professor Wiart, who has worked at UNMC for almost a decade, is widely-regarded as the most prominent authority in the field of Asian ethnopharmacology and ethnobotany. For more information on his work, watch his appearance (above) on Vice on HBO, talking about antibiotic resistance and potential plant-based solutions that could be hidden in the Malaysian jungle. Driver-less trains, dancing ‘lions’ and degree processions: my Malaysian memories…. very nice and knowledgeable post. I liked Rafflesia. Good information on rain forest especially on deadly plants like nux vomica and Excoecaria agallocha. 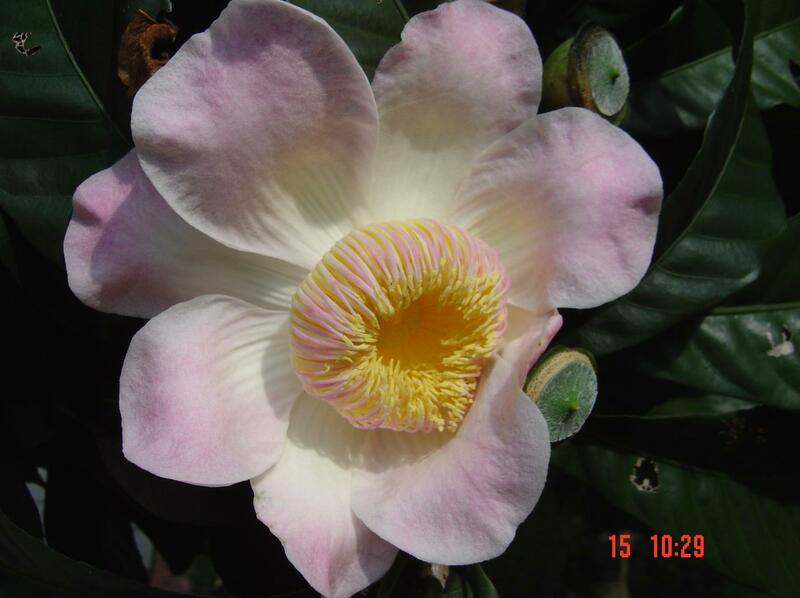 I am specialist in Pharmacognosy and your information quite useful. Nice information available in this website..! Nice articles are placed in this website..! Nice articles are placed in this website….! Thank you for sharing this amazing post..
nice information shared thank you and i am interested to visit again. I have understand your stuff previous to and you are just too great. I actually like what you’ve acquired here, certainly like what you’re stating and the way in which you say it. You make it entertaining and you still take care of to keep it smart. I cant wait to read far more from you. This is really a wonderful website. Good post and thanks for the information shared and this make me to visit your portal again. They’re very convincing and cann definitely work. Still,the posts are too quick for newbies. Could you please extend them a bit from subsequent time? Thank you for the post. Nice Post. Thanks for Information. Thank you for a Great Topic. Really it was Excellent..i was gather more information from your site.. Thanks for sharing this excellent information it’s really very interesting..
Great one. I love it. Another outstanding blog by Emma Lowry & this time again it is very informative. I never thought that the Cerbera odollam & Rafflesia would be seen again but this time it is. Thanks for sharing such a wonderful blog…it contains more valuable text. Are green tea plants grown in this area? All the latest news and events from the UNMC Campus.